Several industries have sprouted since Bitcoin created an innovative entrance, particularly in the finance and technology sectors. BTC.sx, the first Bitcoin-only trading platform, saw a great opportunity with Bitcoin usage and used this to serve a significant portion of the trading market. 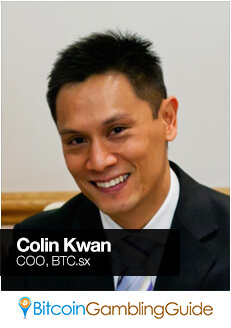 In an interview with Chief of Product Management and Operations Colin Kwan, he talked about the beginnings of the company that introduced groundbreaking trading possibilities and how BTC.sx will continue to live up to its vision of easy and fast Bitcoin transactions for all without the usual barriers. Every Bitcoin enthusiast has gone through a journey– what led you to be interested in Bitcoin and come to believe that it is something that you would devote much of your time to? Most people talk about Bitcoin changing the way we do finance. I have a 15-year background in Investment Banking and Finance and 22 years in Technology. I have seen how finance is processed from a commercial perspective and I know that in the last 15 years, improvements have progressed incredibly slowly and, for the most part, are undeniably expensive for what is offered. Traditional finance is bureaucratic and burdened with middlemen. I see that the Internet and Bitcoin can change all of that. It will reduce my own personal costs for doing business let alone the rest of the world. How long did it take you to launch your website? With BTC.sx, we started the idea back in late 2012. By early 2013, we created and tested an alpha version of the platform based on Mt.Gox and were able to launch our online Beta version in April 2013. The site has moved on quite a bit from those earlier days and now we have branched out to 3 different exchanges and we are looking to bring on many more. What can you say is the best thing about your website? As mentioned, speculators are necessary in any market. Without speculators, the free markets are not available. Business is then only performed directly with suppliers, which then creates barriers and inequalities in the relationships. Speculators drive liquidity that regulates the supply and thus the costs. Our site provides tools for speculators to trade with the exchanges without having to deal with each of the exchanges directly (thus having multiple accounts). In addition, users can speculate and profit from prices going up (buy low, sell high – called going “long”) as well as profit from prices going down (sell high, buy low – called going “short”). The latter cannot be done on the exchanges, as you must hold the asset before being able to go short. The leverage also gives the users the ability to trade more without having to use up their entire funds (leveraging is similar to taking a mortgage on a property, you still have to place a deposit and with a mortgage you can get a much bigger house). What can you say about gambling laws and cryptocurrency regulation? Gambling is an incredibly large and mature industry and online gambling, specifically, has gone through very similar scenarios as crypto is going through now. I believe that similar regulatory requirements are necessary to ensure safety and protection of the consumer as well as legitimizing the entire crypto industry. What do you think Bitcoin needs to become a more prominent and reliable form of payment? Bitcoin needs to focus more on resolving the problems that the incumbent financial institutions have not been able to or are not willing to change. Monopolies need to be broken (Visa, MasterCard, etc.). Thus, providing easy access to finance to the everyday person, as well as creating cheaper, faster, and more transparent ways of transferring money across borders and doing traditional commerce. When we can meet these demands and fix these problems, Bitcoin will by virtue become more prominent. As the old proverb goes – “Rome wasn’t built in a day”. What have been the greatest accomplishments you have had while operating your website since its inception? What has been the most surprising challenge in your project? One of the more memorable times for BTC.sx was when we were able to move quickly (2 days) from Mt.Gox to BitStamp after the collapse. This was a massive undertaking; however, we owed it to our clients. Not only was this challenging, it was also extremely rewarding to know that our clients were able to operate again so quickly. Another occasion was when we surpassed the $50m trading volume through our site within the first 12 months of business. The most surprising challenge has been keeping lean whilst growing the business. What characteristics of your business do you consider revolutionary? We were the first Bitcoin-only trading site out there. Even though that sounds trivial now, it was revolutionary back then. We allowed people to trade from all over the world within seconds of setting up an account. Our proprietary characteristics were also the first in offering the short side trading. Meaning, you could also profit from selling high and buying low instead of just buying low and selling high. Additionally, our leverage product gives complete control to the users so that they can open or close a position at any time of their choosing (where most other competitors only provide futures or similar contract-based leveraged products that require 2 counterparties and are far more complicated to maintain). Our users love how simple it is to open positions with us; they are also very much appreciative of the transparency of our site. All profits are paid out in full. This is the trust that we have created with them and we want to keep things that way. Do you have a Bitcoin price prediction? I believe that with a lower Bitcoin price, people are more willing to buy, which means it will be adopted more widely and thus, the ecosystem will grow steadily and become an everyday commodity such as PayPal. Once the adoption picks up, and because of limited supply, the price will rise accordingly reducing volatility swings. Finally, for those who don’t get Bitcoin, do you have any suggestions? And anything more that you wanted to add? It is the way of the future. Like it or not, Bitcoin or cryptocurrencies will be embedded into the economies around the world and if anyone doesn’t get involved in those areas, then they will be forever fighting to regain what they think they have. Interestingly enough, a lot of companies that held off on utilizing the Internet lost out massively. Those incumbent companies are now trying to reel back the lost revenues from the likes of Amazon and so forth. Do you see Amazon going away? Probably not.